September 20, 2018 marked the 1 year anniversary of Hurricane Maria devastating the island of Puerto Rico. The U.S. government has shamefully neglected Puerto Rico and has chosen to turn its back on providing aid to Puerto Rico. Reports indicate that 4,645 people have lost their lives since the hurricane hit last year. 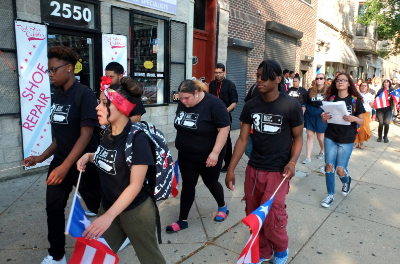 To commemorate Hurricane Maria, Albizu Campos participated in a caminata or a walking vigil as two-fold call to action on September 20. The first call to action to decolonize and liberate Puerto Rico from the crippling hands of the U.S. The second call to action to remember the thousands of individuals who died in Hurricane Maria due to the lack of resources and aid. 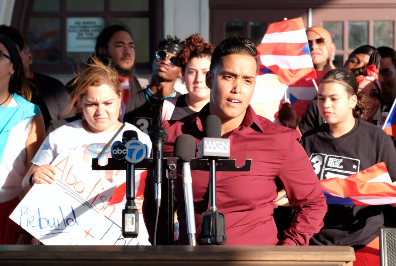 Our students and staff participated in a press conference following la caminata and showed the press how brave and powerful our young people can be! Unity for Social Analysis is the space in our week where we come together as a school. We maintain a sense of family through this special time. We promote student voice/choice, learn about our school and community challenges, and empower students to be involved in the work of community building. During our third week of school, we shifted focus to “Honoring a Family Member Lost”. Unity for Social Analysis allowed us to share and process the feelings of grief we experience. 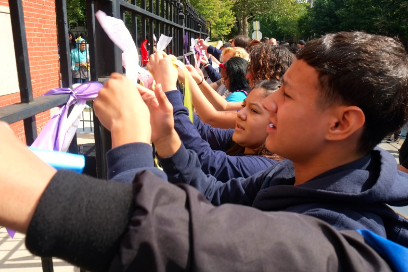 Below our students come together and tied ribbons to our gates in front of our Haddon Building in honor of someone who has passed. 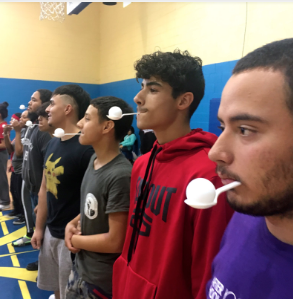 Last week, we let loose in Unity and had PANA Olympics. Each homeroom was able to compete beginning with an Egg Race. We all laughed and had a good time while our homerooms competed for #1 PANA! 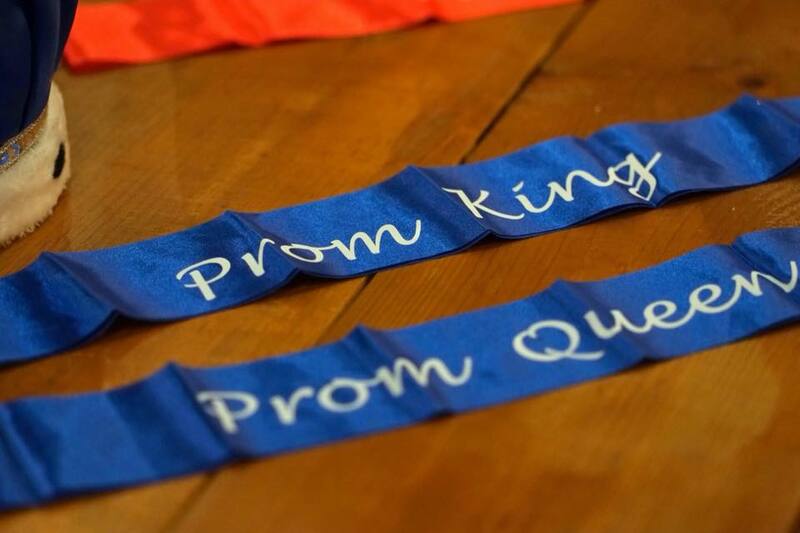 Congratulations to Jayuya PANA and their leader Zoraida! Previous Post Unity 9/19/18 – Honoring the Lives of Those Who Have Passed.